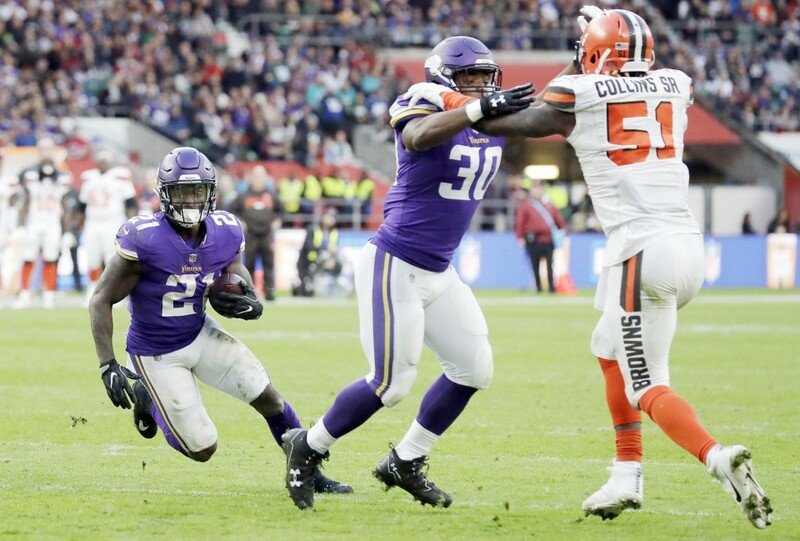 The Cleveland Browns held a halftime lead for the first time all year, but were outscored 21-3 in the second half and dropped to 0-8 going into the bye after a 33-16 loss to the Minnesota Vikings in London. Isaiah Crowell led the Cleveland offense with 118 yards of offense including a 26 yard rushing touchdown. The winless Browns are off next Sunday before traveling to Detroit to play the Lions in two weeks. 1) This team has to play the perfect game to win against a good team as the Vikings are, but let's keep this in mind-Minnesota is missing its top two quarterbacks and its top running back and still won by 17. For all of the talk about this improved talent-facts are facts, this team and the Sashi Brown led revamp just doesn't have the talent to compete. They'll fall into a win this year, but I'm just not sure where. 2) The trade deadline is nearing (next two days) and the rumors are flying that T.Y. Hilton of the disappointing and Andrew Luckless Indianapolis Colts might be on the market for a second round draft pick. Considering that the Browns have three second rounders if that indeed is the cost and if the Colts will accept either the choice from the Eagles or the Texans-I'm all in and take it before they change their mind. Hilton is a deep threat, a number one receiver, in his prime at 28 and is signed for two years-All things considered, I'm in..
3) Isaiah Crowell did finish with over 100 yards of total offense, had a run for 26 yards for a touchdown and a pass reception for 38 yards, so Crowell does appear to be waking up. He did fumble following the second half kickoff, so he wasn't perfect, but I feel better than I have about him all season. 4) DeShone Kizer didn't throw an interception and finished the game, so there was some progress there, but Kizer didn't throw downfield often as Hue Jackson kept the game plan simple to avoid mistakes. That was successful, but the team isn't going to progress playing it safe and it will not do a lot for any chance of Kizer developing into anything more than another footnote among the line of failed Browns passers. 5) One week after Zane Gonzalez appeared to have turned the corner, Gonzalez went off the rails as he blew an extra point and missed a field goal from 35 yards. A team that struggles to score cannot afford an erratic kicker and Gonzalez will likely see some kickers in town to challenge for the job during the bye. 6) The favorite player of Briton's everywhere in Kenny Britt never saw the field for one play. The most damning indictment of the ineptness of Sashi Brown and his bunch (and that says a lot) the Browns need to just cut their losses and release Britt now. 7) Joe Schobert played well and seemed to be in on every play with 11 tackles, an interception, and a forced fumble. Schobert plays best against teams that run more than pass, but he is maturing into a solid linebacker that is capable of playing three downs. 8) The Browns also got something out of Carl Nassib for the first time in what seemed like forever. Nassib tipped the pass that Joe Schobert intercepted had a sack and had his best game of the season. 9) The Browns really miss Jason McCourty, but you cannot blame that missed coverage for a touchdown by Adam Thielin on the missing cornerback. Thielin was so wide open that I could have caught that pass-there was no Brown even in the TV screen!! 10) Bryce Treggs fumbled a punt that led to a Viking field goal. 11) As the Browns spiral further down the drain, I've been asked about Hue Jackson being fired at the bye. It won't change the personnel on the team and I don't see a change in the play calling happening either. Play out the string would be my preference, but I don't see it making a difference either way. 12) As for Sashi Brown, I don't know what his future is, but a tip off might be what the Browns do at the trading deadline and yet we won't even know it. If they bring someone in, it could be perceived as a panic move to help save his job. If they don't, it could be seen as the tap being turned off by Jimmy Haslam to not trade assets in case Brown is removed. The boxing challenge hit Cardiff, Wales for three bouts in the challenge with the main event featuring Anthony Joshua defending his WBA and IBF heavyweight titles against late substitute Carlos Takam. 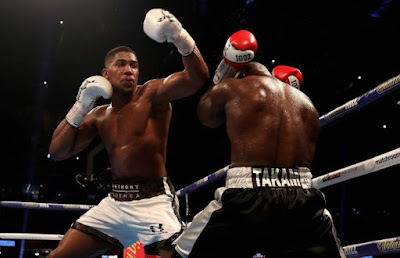 Joshua would get his 20th stoppage win and maintain his perfect knockout percentage, but the tough Takam was far better than most expected in taking Joshua into round ten before the referee made what most observers saw as somewhat of a quick stoppage. I had Joshua ahead 90-80 after nine rounds, winning every round, knocking Takam down in the fourth, which was the same round that a Joshua right hand badly sliced open the right eye of the Cameroon native fighting out of France and controlling the bout. However, it wasn't all good news for Joshua asTakam was a true warrior that landed some shots on Joshua and never stopped trying to win. Takam's best shot though came in round two when a headbutt broke Joshua's nose. It was the type of fight that young champions need to go through. 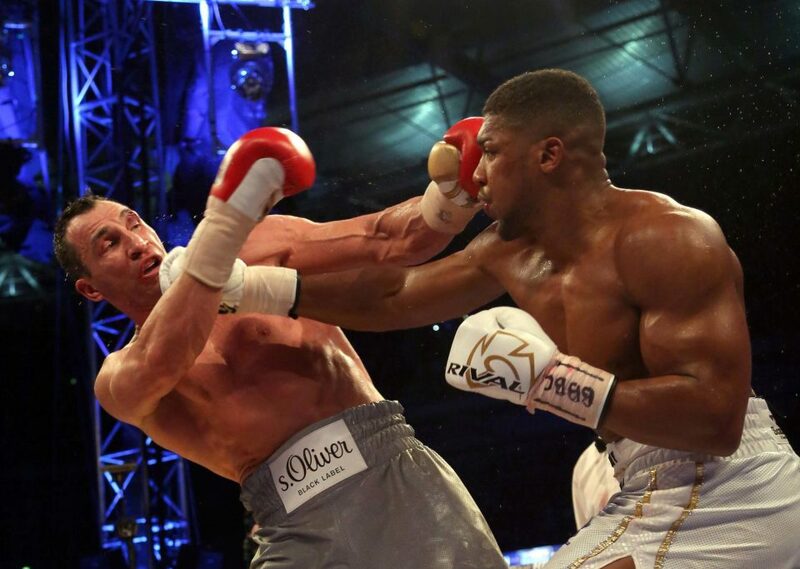 Not every challenger is going to fall to the mat, no matter how limited or how qualified and it's good for Joshua, who still needs to develop a bit as a finished product. Joshua's promoter Eddie Hearn has Joshua fighting three times and named WBC champ Deontay Wilder and WBO titlist Joseph Parker as likely fights (I'll believe that when I see as handlers for both fighters have been less than grandiose in matching their fighters tough) and former champion Tyson Fury, who I'm dubious will ever fight again. Somewhere will have to be a WBA mandatory and that organization has sanctioned the winner of an Alexander Povetkin-Christian Hammer fight as the next mandatory from their group. Considering Povetkin being the likely winner of that fight and his history with PED"s (Popped twice), Joshua might have time to fight three times before a WBA mandatory fight. Hammer has two recognizable wins in the last five years over American journeyman Kevin Johnson and soft-jawed Brit David Price, so I'm doubtful he defeats the skilled yet troubled Povetkin. On the undercard without American television and as of now, no Youtube. Kal Yafai retained his WBA junior bantamweight title with a unanimous decision win over mandatory challenger Sho Ishida. 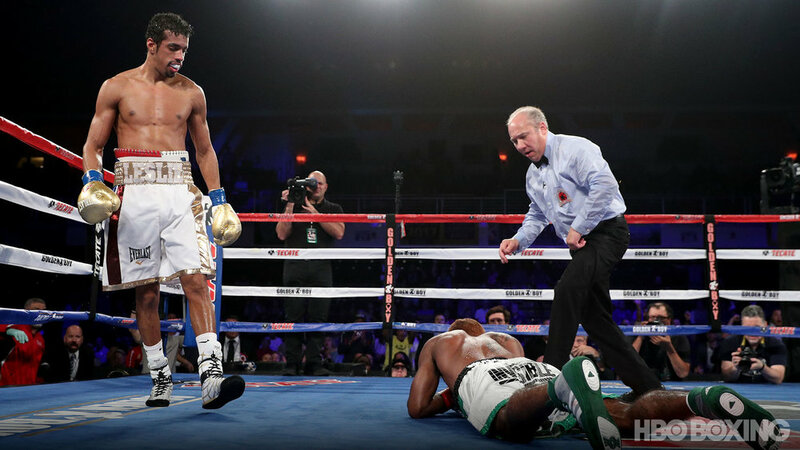 Yafai is rumored to be part of the next HBO "Superfly II" card defending against Roman "Chocolatito" Gonzalez. 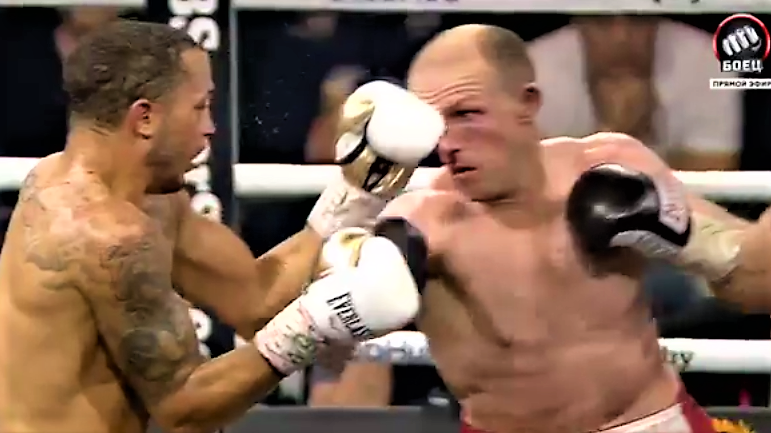 Former Joshua foe Dillion Whyte won a unanimous decision over Finland's Robert Helenius. Whyte is a rumored possible opponent for Deontay Wilder, should Wilder get by Bermane Stiverne next Saturday on Showtime. I had plenty to say during much of this game and not all of it nice toward Ohio State senior quarterback J.T. Barrett. I was doubtful that Barrett had the arm and skills to bring Ohio State from behind to stun the second-ranked Penn State Nittany Lions after trailing by double digits almost all game. I was wrong as Barrett suddenly morphed into Tom Brady in the 4th quarter as my friend Ian McArdle said after the score that brought the game within five points and then gunned the game-winning score to tight end Marcus Baugh with 1;48 to go with Ohio State getting the 39-38 victory in Columbus. Barrett threw for four touchdowns,328 yards through the air and 95 more on the ground. K.J.Hill caught 12 passes for 102 yards and Johnnie Dixon grabbed two touchdown passes in the victory. The Buckeyes improve to 7-1 (5-0 in the Big Ten) with the win and will travel to Iowa next Saturday controlling their destiny in the conference and the national playoffs. 1) Here's my Mea Culpa' to J.T. Barrett. I've been often critical of his passing accuracy beyond 15 yards, his lack of getting the ball downfield and wondered if the Buckeyes could defeat good teams with Barrett at quarterback. 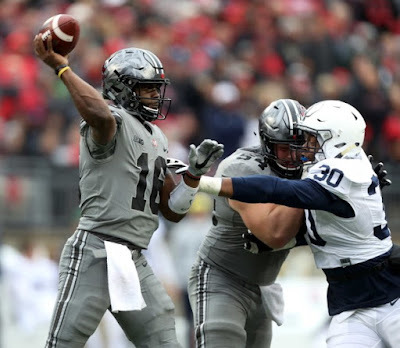 As late as during the first half of yesterday's game, I was still groaning about J.T, Barrett's shortcomings in frustration over the Ohio State deficit during what was an uphill battle against the Nittany Lions. The victory in this game belongs to J.T.Barrett as he grabbed the game by the throat with three fourth-quarter passing scores, completing his final 13 passes and the two final scores with under five minutes remaining. 2) I'm still just in shock that Barrett was able to pull this off. I just didn't think he would be able to use his arm to carry Ohio State to a comeback win against a decent team, let alone one of the quality of Penn State. 3) As I watched the game and discussed it as the game went with Ian McArdle, as I usually do, I am available on social media on Twitter and Facebook and friends emailing me. What did I hear the most complaints about? Special Teams? Coaching? J.T. Barrett? It was like a downpour of rain on a windshield and you know what? It was all from others about the performance of what I believe is the most annoying play by play man in the game, but not from me. Did Gus improve in my eyes? I watched the game on mute. It does take away a little from the atmosphere of the game, but I can judge the game as I see it-not as someone hyping a two-yard gain beyond belief. 4) Yes, I know Saquon Barkley is a tremendous back that will likely star on Sunday's starting next season, but take away the opening kick return for a touchdown (and you should as returning kicks is different than your game in the backfield) and the one score of 34 yards and you have Barkley finishing with eight yards on twenty carries. Ohio State did a fine job not letting Barkley beat them-from the backfield at least. 5) And the book is out on Trace "Chuck and Duck" McSorely as well. I was so frustrated during last season's game (and live at the Big 10 title game vs Wisconsin) watching McSorley just throw the ball up and pray. However, I figured that after teams would have an off-season rather than less than a week to prep for this stuff that his effectiveness would drop and it did so. McSorley did throw for two touchdowns (arguably one should have not have occurred), but under 200 yards on the day and looked confused on the final drive when he had to find his reads and not throw sideline passes and demand his receivers go get the ball. 6) Ohio State still has massive issues on special teams, but let's look at the good side first. In Penn State's win last year, Penn State swung the game after blocking a Buckeye field goal attempt. This year, Ohio State began its comeback when Denzel Ward raced in and rejected a punt by Penn State's Blake Gillikin. 7) However, the opening kickoff return for a score by Saquon Barkley showed huge deficiencies continuing in the coverage units and when the Buckeyes tried to avoid Barkley after that they gave up another huge return that set up a score and almost gave Penn State more points in the first half when a kickoff that was attempted to be squibbed gave the Nittany Lions the ball around midfield, which leads us to Mr.J. Franklin shortly. I still think Urban Meyer needs to hire a full-time special teams coach, but Meyer seems reluctant to try that. 8) James Franklin has been given kudos of late, but I didn't think he did a good job in this game. Franklin had the ball near midfield after the kickoff I mentioned above and with a quarterback that does one thing well-throw it and hope. Franklin passed on the chance to move the ball late in the half. Then the final drive and deep in their own territory if Penn State makes two first downs, they likely win the game. Franklin called the same three run plays with Saquon Barkley that Ohio State stopped all day and the Buckeyes did so again setting up the Ohio State winning drive. With three likely big money jobs in the SEC likely to be open soon (Florida, Tennessee and Texas A&M), James Franklin might be ready to take a look. Penn State will lose Barkley and even though their recruiting classes have been strong in the last two years.Franklin might look at the Big 10 East and think this is as good as he'll have it. At Florida or Tennessee, he might have it easier and Texas A&M isn't afraid to cut a check. Don't send Franklin packing just yet, but don't rule it out either. 9) Breakout night for K.J. Hill with 12 catches and over 100 yards as a replacement for Parris Campbell, who was knocked out of the game as he fumbled early in the first quarter. Campbell has had ball-handling issues all season, it may be tough for him to get back into the lineup with Hill playing so well. 10) And there were the officials, who seemed to miss Penn State's offensive line tackling Nick Bosa all night but blew two calls that could have cost Ohio State the game. The first was the worse of the two as Damon Webb picked off a Trace McSorley pass in the end zone, but was called for a ridiculous pass interference call. McSorley would shortly thereafter run for a score and seven points for Penn State that they shouldn't have had. The other one was a pass that Penn State's DeAndre Thompkins appeared to have lost the ball in the end zone to Denzel Ward and on the field, the call was an interception for Ohio State. The call was reversed, which was one of those that could have gone either way but appeared to me to one of those that normally goes the way it is originally called. Even Penn State fans are admitting in social media that they received several close calls and they have no beef to be made. 11) Loved that the game-winning throw was caught by tight end Marcus Baugh. Ohio State doesn't use the tight end as much as some teams do and they should do it more soon with four-star tight end Jeremy Ruckert on his way in next season. Baugh can help open up over the middle and I wish he was more involved in the offense, but I'll take that score all day! 12) My favorite non-touchdown play of the day goes to Sam Hubbard on a play where Trace McSorley and Saquon Barkley either botched a handoff or was trying to cause some misdirection with the ball towards the Ohio State defense. Hubbard didn't choose which to tackle between McSorley and Barkley, he simply said to hell with it and tackled them both at the same time! 13) The uniforms received mixed reviews over the course of the day. I liked the helmet, which I'll buy a mini of to add to the collection, and I didn't mind the uniforms, although I wished the names and numbers would have some sort of outline to make them easier to read from a distance and on television. However, I'm still not a fan of the alternate uniforms whether they are good (the black chrome ones used in 2015),the bad (the 1957 tributes worn vs Michigan that really didn't look like the 1957 ones or the blank black matte used vs the Wolverines last year) and the indifferent (the gray's used in this one). Part of the Ohio State tradition is the uniforms and I hate seeing those messed with. I can live with a small tweak like a full chrome helmet or a throwback look, but I'm not a huge fan of the gimmick uniforms. I don't buy the "helps in recruiting" either, Alabama and yes, Penn State do just fine in recruiting and they don't do these at all. 14) Ohio State likely controls its own destiny for the National title tournament and definitely controls its own chance for the Big Ten East championship. Win out over the final four games (at Iowa and at Michigan and getting Michigan State and Illinois in Columbus) and they will play Wisconsin in Indianapolis for the league title and a berth in the final four. Go 3-1 and they'll be out of the national title chase, but as long as that loss isn't to Michigan State, they will still be on their way to Indianapolis and the currently undefeated Badgers. I haven't written about the New Jersey Devils often lately as they had six days off and then when they return on both nights, they are up against football or boxing etc, but I did want to hammer out a few words on a minor trade that the team made a few minutes ago as the Devils traded goaltender Scott Wedgewood to the Phoenix Coyotes in return for a fifth-round draft pick in next year's draft. The 25 year old Wedgewood was the Devils third-round selection in 2010 and spent most of the last four seasons as the Devils main goaltender at the Devils then-AHL franchise in Albany. Wedgewood did play twenty games in 2015-16 when Cory Schneider missed time due to injury and Wedgewood backed up Keith Kinkaid, playing four games, winning two and notching a shutout. Wedgewood had made a recent stop with the parent Devils when Schneider had a minor injury and then left the team with his child on the way, to back up Kinkaid, but did not play. Arizona had been dealing with some goaltending issues, so Wedgewood might at least get a chance to be the regular goalie for the Coyotes AHL team in nearby Tucson, if not have a chance to backup in Phoenix, so getting Wedgewood for a fifth rounder helps Arizona in a time of need, gets the Devils a moderate return and helps the player receive a fresh start in his career, so this works for me for all parties involved. What this truly does is cement Mackenzie Blackwood as the Devils "goalie of the future" (these things are often fluid though) in their new AHL home in Binghamton. Rather than splitting time with Wedgewood, who I would think has a ceiling of NHL backup at highest, Blackwood will now get to play every night and mature as a prospect in the top developmental league. The 20 year old Blackwood played 36 games last season in Albany with a goals allowed average of 2.55. At 6'4 and a "butterfly" style goalie, Blackwood has the physical tools to be the Devils future goalie and with Wedgewood being moved on to the desert, the Devils feel so as well. I'll try to do a Devils report, if I have time, but I will be back later for sure with Ohio State hosting Penn State in the game of the year to date and Anthony Joshua's heavyweight title defense vs Carlos Takam. Return of the PPM for a big weekend with the Penn State charge into Columbus to meet the Ohio State Buckeyes. The boxing challenge began a day earlier in Germany as the World Boxing Super Series finished their quarter-final round with the last super middleweight bout between fourth seed Jurgen Braehmer and Rob Brant. I was surprised to see the seemingly near the end of the line Braehmer dominate with his jab and take a unanimous decision with pretty lopsided scorecards with the closest being 116-112 for the veteran German, which was the score that I agreed with on the night. Brant won three of the first four rounds on my card, but would only win one round after as Braehmer controlled the bout from distance as Brant's punch output simply slowed far too much for him to win a decision on German ground. I was torn entering this bout as Braehmer hadn't fought in a year, had quit on his stool in his last bout against Nathan Cleverly and was dropping a division in weight, but Brant hadn't fought anyone near a contender and was moving up from middleweight to participate in the tournament. I picked Brant (as did Ramon Malpica) to win and I figured that he would be the more active and more motivated fighter, but it didn't appear to be the case in fistic action. The Braehmer win moves him to the World Boxing Super Series semi-final against second seed Callum Smith of Great Britain in a less than inspiring fight on paper. Smith is the higher seed, but I would not be surprised if the fight happens in Germany with the other semi between George Groves and Chris Eubank Jr is almost a certainty to be British bound. The challenge starts early this week as the World Boxing Super Series concludes its quarter-final fights on a Friday from Germany. However, we start with the biggest fight of the weekend from Cardiff, Wales on Showtime as WBA and IBF heavyweight champ Anthony Joshua defends his two titles against late replacement Carlos Takam. The original opponent was to be the IBF's mandatory contender Kubrat Pulev, but Pulev pulled out shortly before the bout with a shoulder problem. Takam was the highest rated contender that was willing to take the fight so this bout will be considered Joshua's mandatory defense for the IBF and Pulev will have to start over in building his claim for a future title shot. Joshua returns to the ring for the first time since his fight of the year contender vs Wladimir Klitschko that saw both men hit the floor. Takam has been a top 20 contender that suffered both of his losses when the competition increased against Alexander Povetkin and Joseph Parker. The co-feature in Cardiff has the unknown factor in the suddenly red-hot junior bantamweight division as WBA champ Kal Yafai is defending against undefeated Sho Ishida of Japan. Yafai is a heavy favorite to defeat Ishida, who has never fought outside of his home country and has never beaten anyone near the top 20 with his last two opponents being fighters making their pro debut! Yafai will get his chance to join the elite of the division with his WBA belt as he is expected to defend against Roman Gonzalez with a successful defense against Ishida. The final challenge bout from Wales matches heavyweight contender Dillion Whyte against the once-promising Robert Helenius of Finland. Whyte's battle with Anthony Joshua was the champion toughest other than Wladimir Klitschko and with Whyte's war with Dereck Chisora, Whyte has become a solid contender and one that would be a welcome challenger against Joshua or one of the other two champions in Deontay Wilder and Joseph Parker. Helenius was thought to be a future contender six or seven years ago but has never faced a top 20 fighter other than his fight with the aforementioned Chisora, which Helenius won in one of the worst decisions of the year. And then there is the reason the challenge is being posted on a Friday as the World Boxing Super Series finishes the super middleweight bracket with the last quarter-final with Germany's Jurgen Brahmer against the only American in the tournament Rob Brant. Brahmer was a minor titlist at 175 pounds and spent most of his time knocking off C-level competition in Germany for years before losing to Nathan Cleverly a year ago before dropping to 168 for the WBSS. Brant appears to be a talented prospect but hasn't fought anyone remotely resembling a world class fighter. The USFL series continues with another addition to the Forgotten Superstars in the 1983 Chicago Blitz. This installment follows the first edition (which I should have listed in chronological order, but I didn't think about doing the three-team series) which I wrote about the 1984 Arizona Wranglers. If you read that piece, you'll understand how the switch from the Blitz to the Wranglers took place, so for the purposes of this post-I'm sticking with the 83 Blitz and what took place before that move. I wrote in that same piece about why I picked the Blitz as my team when the league started, which was basically that I liked George Allen as the coach and general manager, the Blitz had a decent amount of former NFL players with two players that would have likely been first-round picks in the 1983 draft- Tim Spencer, a running back from Ohio State (that didn't hurt any) and Trumaine Johnson, a talented wide receiver out of Grambling. Spencer would prove to have one other piece of TRS trivia-Spencer would be the only player that would play for all three teams (in three different cities) that I would root for in the three year league history. I decided to pick the Blitz over the runner-up Boston Breakers and went to that store at the mall that I mentioned in the Wranglers article- American Outfitters and bought the Blitz hat (the Super Stripe) to cement my fandom. George Allen was well known for his tireless work ethic and you had to figure that the Blitz were going to be talented because he was going to find talent and veterans were going to want to play for the veteran head coach. Allen signed the first player in league history as he signed UCLA tight end Tim Wrightman, who had been the Chicago Bears third-round pick in 1982 but didn't sign in a contract dispute. It was surprising that Wrightman would hold out for an entire season as there weren't many options for players, they either signed or not, but the USFL's arrival opened up options not seen since the mid-1970's WFL and that would result in the huge increase in player salaries thereafter. Allen's signing of Wrightman established that the league was for real and that NFL teams were going to have to take the USFL seriously as a legitimate player option, if not a challenger to the NFL's dominance. 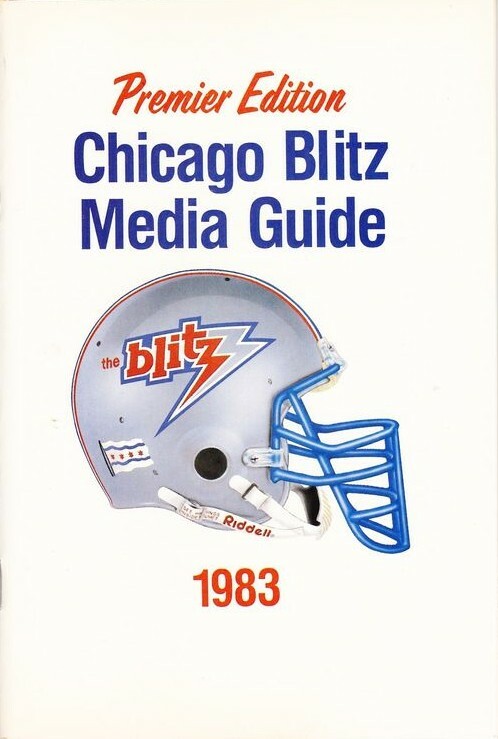 The Blitz, mainly because of Allen and a number of recognizable names, were considered to be the pre-season favorites to win the USFL's inaugural season. Accordingly, the first game on ABC for the national (non-ESPN) broadcast was the Blitz traveling to Washington, where Allen had coached the Redskins, to play the Federals at RFK Stadium. Chicago crushed the Federals 28-7 and even though Washington would prove to be one of the weaker teams in the league, after week one, the Blitz did seem to be the class of the division, if not the league. Allen's Blitz quickly proved that they weren't invincible with losses in their next two games that ranked among the most memorable in the 1983 season. Chicago traveled to Tempe to meet the Wranglers and blew a 29-12 lead with eleven minutes to go in a 30-29 loss that features a two-point conversion quarterback chase by the Blitz racing after Arizona's Alan Risher that occasionally pops up in movies (you see a lot of USFL clips in films and television because their games are now considered public domain). 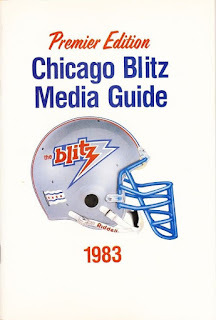 The following week saw the Blitz's first home game at Soldier Field on national television on ABC and was greeted with a snowstorm in a 16-13 loss to the Denver Gold. You could blame the snow, but it did snow for both teams and the league favorite was 1-2. The ship was righted though as Chicago would win 11 of their final 15 with two whippings of Steve Spurrier's Tampa Bay Bandits (one of those the first defeat of the final undefeated team in the league), two overtime wins over Herschel Walker and the New Jersey Generals (Donald Trump would buy the Generals after the 1983 season) and a 31-7 season-ending win over the Pacific Division champion Oakland Invaders standing out among those wins. Chicago was one of the more balanced teams with Tim Spencer and former New York Jet Kevin Long each rushing for over 1,000 yards on the ground and the passing game was strong too with former Detroit Lion Greg Landry and former New Orleans Saint quarterback Bobby Scott combining to throw for over 5,000 yards in the eighteen game season. Trumaine Johnson grabbed 81 passes for 1,300 yards and was one of the league's premier deep threats as the main receiver for Chicago. The defense was filled with former NFL players as former Colt Joe Ehrmann led the team in sacks with 13.5 and two former NFLers led the team in interceptions with former Lion safety Luther Bradley picked off 12 passes (SIX of those in one game vs John Reaves and then the undefeated Tampa Bay Bandits) and Eddie Brown, who played for George Allen in Washington, intercepted six more. CFL Hall of Famer Junior Ah You finished with eleven sacks, former Colts (and Ohio State) linebacker Stan White was the veteran crafty middle linebacker, but my favorite defender was former Bears corner Virgil Livers, who was this short corner that reminded me of former Redskin Pat Fischer, who was one of my favorites as a kid in the 1970's. The biggest issue for the Blitz was losing both games to the Michigan Panthers (the eventual league champions), who the Blitz shared the Central Division championship with. Those losses would send Chicago to Philadelphia as the wild card for the four-team playoffs. Had the Blitz been the division champion, they would have hosted the 10-8 Invaders instead. It was time for another memorable game for the Blitz and one long remembered by fans of the league. The Blitz forced seven Philadelphia turnovers, four of those interceptions of Stars quarterback Chuck Fusina and entered the fourth quarter leading 38-17. That lead wasn't large enough vs Kelvin Bryant and the Stars as Philadelphia would score three fourth-quarter touchdowns to tie the game to force overtime, win the toss and march down the field to end the Blitz's season with a 44-38 overtime loss. Despite having one of the best teams in the league, the Blitz didn't really draw well and lost a lot of money with an average attendance of barely 18,000. Those facts, the owner living in Arizona and wanting to own a team there, the off-season saw the strangest move in pro sports history where the rosters and coaching staff were traded to Arizona for that of the 6-12 Wranglers. If a championship contender drew 18,000 fans, a 5-13 team was going to attract even fewer and that came true as the "new" Blitz averaged less than 7,500 customers. Chicago, which was an important market (as Chicago usually is with any sports league) was essentially finished for the USFL and would not have a team for the league's third and final season. My favorite Blitz memory (besides watching the games with my brother, as he was the only other local person that I knew that cared about the league) from a personal standpoint was just before the season started. I was a freshman in high school and then as now, I loved drafts and with a startup league filled with such information in the non-internet age, I devoured anything that I could get. The Sporting News had a thin guide that came as a bonus to subscribers, the local paper had a list of players from the draft with the territorial assignments that the league used as part of the player process and I constantly carried these things around with me to evaluate the league and who would be the league's contenders etc. For every minute that I spent in 7th period study hall (held in a beautiful cafeteria overlooking a hill, a dying creek, and a fence) spent on school work, I spent 40 minutes on USFL evaluation in the winter of 1982-83. These stories show just how socially active I was as a high school freshman and just why I flourished in so many ways in 1983 (insert your snicker here) both socially and academically as the USFL was more important to me than biology or algebra for sure. 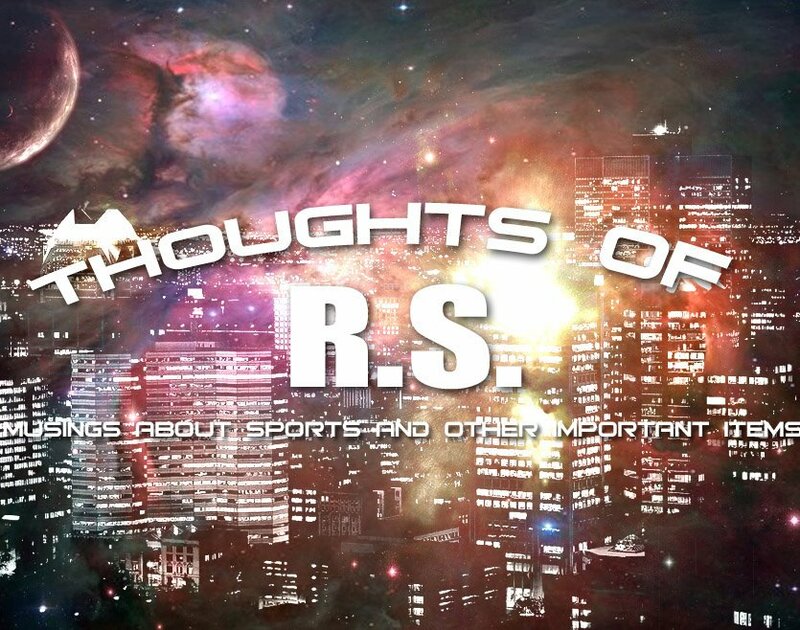 Hope you enjoyed some memories of mine on the latest Forgotten Superstars in the TRS universe on the 1983 Chicago Blitz. 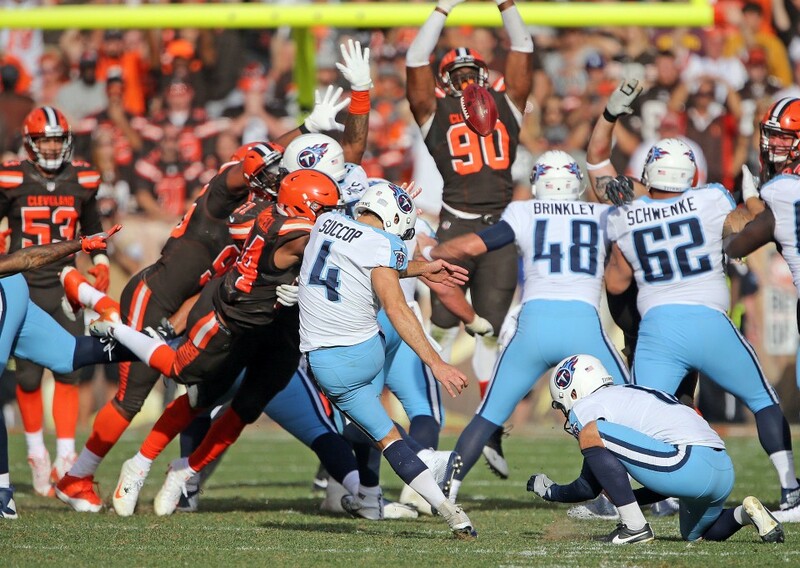 Zane Gonzalez nailed three field goals including a 54 yarder to tie the game with less than a minute in the fourth quarter and Gregg Williams defense finally showed what it could be against the Tennessee Titans. The problem was the Browns did little under two quarterbacks when a touchdown would have won the game before Ryan Succop won the game 12-9 for Tennessee in overtime. 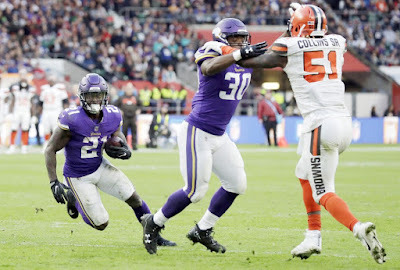 The now 0-7 Browns travel to London next Sunday to face the Vikings in a game that I'm sure the fans in the United Kingdom cannot wait for. what a battle of two awful uniforms. The Browns, who looked like a bag of Reese's Pieces with too many brown's and not enough orange's and the Titans with their two-toned light blue and white featuring the worst of the 90's-bleech. 2) The one thing that the Browns have improved in another bad campaign is stopping the run. The Titans are a run-based team with strong backs like DeMarco Murray and Derrick Henry and Cleveland shut the pair down to 72 yards on 31 carries, particularly Henry, who finished with 13 yards on 13 handoffs. Want one bright spot to hang your hat on for this season? Stopping the run. 3) This was the best we've seen from Gregg Williams this year and they did it without two starters in the secondary as Jason McCourty and Jabrill Peppers each missed the game with injuries. Granted, Tennessee's passing game is almost as bad as the Browns and aren't often confused with a powerhouse with the football, but it was a quality outing that honestly deserved a victory. 4) And they held Tennessee on four shots at the goal from the one yard line in the third quarter. It's the occasional plays such as those that give me fleeting glimmers of hope. I've really seen Danny Shelton mature as the type of run stopper that the Browns drafted him for and perhaps become the Haloti Ngata type player that teams place for years as bulwarks of their line. 5) One final piece of good news was the three field goal outing for rookie Zane Gonzalez, who had his struggles earlier this year. The game-tying boot from 54 yards out fluttered more than a Phil Niekro knuckler at the same location (remember Niekro's 11 wins for the 86 Indians at 47 years of age? ), but accuracy in situations such as that one is huge for a bad team that needs every point they can get. 6) The worst news comes from the triceps injury to Joe Thomas that will likely end the season of the All-Pro left tackle. Thomas has been the best in the game for so long and an injury like this at 33 could end a career. Biceps and triceps injuries inhibit the ability to extend your arms and has ended the career of many pro wrestlers and offensive linemen, which need this range of motion to play their positions. 7) Hue Jackson just head-shakingly dumb in benching DeShone Kizer. Look. I know Kizer threw two bad interceptions (one in each half) and has shown that he is prone to the big error, but in the last three games, Kizer has been pulled twice and benched once. If Hue Jackson didn't want to play DeShone Kizer, he should have never returned him to the starting lineup. I don't see how Jackson can start Kizer again, he might have ruined any chance Kizer has of having success in Cleveland as Kizer will now be looking over his shoulder to the sideline for Jackson. 8) DeShone Kizer hasn't made it hard for Jackson to pull him though as these interceptions were hardly excusable. Add to that the fact that Kizer's attitude doesn't seem to be the most mature in handling adversity and even though I disagree with Jackson's decision, Kizer has not shown many signs of being "The Guy" that Browns fans had hoped for. 9) One more quarterback note as the move to replace Kizer with Cody Kessler smacks of a panic move by Hue Jackson. Jackson has to know that his job is in trouble and he's desperate for wins no matter who takes the snaps- Kizer, Kessler, Kevin Hogan or the guy with the Pumpkinhead in the stands (I really like him best of all the Browns SuperFans) and he wants to do what it takes to win. Which I am fine with, but what changed in seven weeks to think Cody Kessler is suddenly the best choice? Didn't we go through weeks of training camp to help sift out who the starter was going to be? What changed other than the desperate grasping for victories from Hue Jackson? 10) Hue Jackson has other problems with players apparently not following his rules as injured Kenny Britt and Corey Coleman were sent home early from the Houston game for missing curfew. Britt continued his Dwayne Bowe impersonation with two catches for seven yards and dropping a long Cody Kessler pass in overtime that would have put the Browns into field goal range for a potential win-Woof. 11) The lack of a running game still kills this team. The lack of any type of consistency under center (and Hue Jackson's comment at his press conference where he said he could move QB's in and out all season didn't anyone any good at all) means the Browns, if they truly wanted to try to win, should move into time control and running the ball. 35 yards from Isaiah Crowell isn't going to win games in that capacity. 12) I'm not usually tossing around compliments towards Michigan Wolverines-past or present, but Taylor Lewan's coming onto the field to offer condolences towards Joe Thomas was very classy. Nice touch from a talented player. Hope to hear from any of you tonight on FightHeads! The boxing challenge for the weekend starts in Verona, New York with two bouts from HBO that had varying intensities. The eighth round knockout allowed Machado to win a title that Corrales could not retain after missing weight by multiple pounds at the weigh-in. WBA rules stated that after an agreement to keep the fight going that if Machado won, he would become champion and the title would become vacant with a Corrales win. Machado had won just one round on my card (the sixth, where he should have been given a 10-8 round for a knockdown that was not called) before the abrupt victory. The lean Machado will be an interesting addition to the 130 pound title picture with WBC champ Miguel Berchelt as a possible opponent should he defeat the gritty veteran Orlando Salido in December or the IBF champion (decided on the same card in December as Tevin Farmer faces Kenichi Ogawa for the title that Gervonta Davis sacrificed on the scale in August) for the slot of best in the division other than WBO champion Vasyl Lomachenko. The co-feature saw the return of Demetrius Andrade (TRS #3 at junior middle) moving up to middleweight against undefeated and untested Alantez Fox. In a bout that rivaled any Guillermo Rigondeaux or Erislandy Lara fight for boredom, Andrade won every round on my card, but the seventh and took a unanimous decision. Fox scored a knockdown in the seventh that really was a tangled foot issue. I scored Andrade a 118-109 winner and I hope we see him against better challengers next time out. HBO showed a good bantamweight bout on tape delay from Belfast, Northern Ireland as Ryan Burnett unified his IBF title with the WBA belt with a unanimous decision over Zhanat Zhakiyanov (TRS #3). I scored Burnett a 117-111 winner after the fight was even after six rounds, but saw Burnett dominate the second half of the fight. I'm sure we will see Burnett debut in the next edition of the TRS ratings. In the final quarter-final of the World Boxing Super Series, Murat Gassiev (TRS #2) retained his IBF cruiserweight title in Newark, New Jersey with a body shot in round three that dropped Krzysztof Wlodarczyk for the count. Gassiev moves to the semi-finals against Yunier Dorticos in what should be a thrilling battle early in 2018 and might be establishing the early leader for 2018 fight of the year. Next Saturday will have the final quarter-final in the super middleweights between Jurgen Brahmer and Rob Brant and following that, I'll have a look and some thoughts about the initial round of the WBSS. From Tokyo for a minor title, Ryota Murata avenged one of the worst decisions in 2017 when Hassan N'Dam could not answer the bell for round eight in their middleweight fight. I had Murata ahead on the cards and dominated the fight seen live on ESPN2 at 7;30 AM. My issue is why the WBA made this for their "regular" title, when the organization that claims they want to reduce their titles, could have swallowed this one when Gennady Golovkin defeated Daniel Jacobs in March? There is a manner to force a fight between the champion and a top challenger- it's called being the number one contender and that doesn't mean they are a champion too. In an untelevised bout in the challenge, Daigo Higa (TRS #3) retained his WBC flyweight title with a seventh round knockout of Thomas Massson on the Murata-N'Dam undercard. Higa has won by KO in all 14 of his pro bouts. I earned three points for the Murat Gassiev win (a bonus point for getting the round correct), two points for the Daigo Higa KO win, one point for the wins by Ryan Burnett , Demetrius Andrade, and Ryota Murata and I missed on Alberto Machado's victory. Ramon added two points for Gassiev's win and one each for the Andrade and Higa wins while missing on Machado,Murat and Burnett's wins. The Challenge now stands at 154-137. Don't forget to listen to Fightheads Monday at 8 EST for talk about these and other boxing issues!! The boxing challenge steams forward with six bouts with four titles on the line and a minor middleweight title as well. We start at the Rock, which we usually cover New Jersey Devils hockey from and the World Boxing Super Series finishing the quarter-finals in the cruiserweight division with IBF champion Murat Gassiev (TRS #2) against former champion Krzysztof Wlodarczyk. Gassiev was my pick to win the tournament and comes off a title-winning effort over Denis Lebedev, which netted him the IBF title from Lebedev, but due to a mind-numbing decision by the WBA, not their title. Wlodarczyk is undefeated since losing his title three years ago but against very light competition. The winner will face Yunier Dorticos in the semi-finals early next year. HBO has a two live fight card from Verona New York and an important one on tape delay. The tape-delayed fight comes out of Belfast Northern Ireland with a bantamweight unification as hometown fighter Ryan Burnett puts his IBF belt up against WBA champion Zhanat Zhakiyanov (TRS #3). Zhakiyanov upset American Rau'shee Warren for the WBA title on a PBC show in his last fight. The live card has WBA junior lightweight champion Jezreel Corrales (TRS #3) defending against undefeated Alberto Machado. Corrales barely squeaked by Robinson Castellanos in his last defense getting knocked down twice in a fight stopped seconds into the tenth round when a clash of heads resulted in a stoppage and Corrales earning a close and debatable majority decision. I would have rather seen a rematch, but at 5'10 (Very tall for a 130 pounder) the untested Machado will have some advantages. The other bout sees the return of a TRS favorite as the super talented and just as poorly managed Demetrius Andrade (TRS #3 at junior middleweight) moves up to middleweight after vacating his minor belt at 154 rather than wait for a mandated (and likely tedious) shot at Erislandy Lara against undefeated and yet again untested Alantez Fox. Fox has fought one fighter that you've ever heard of in fringe contender Frank Galarza in his eighth pro fight and drew with him, so not sure what we are getting in Fox. Andrade has bounced from HBO to Showtime and now back to HBO. Then we move to Japan on ESPN2 early Sunday morning as the ESPN/Top Rank contract bears fruit as the network shows the minor WBA title, which should have been left vacant, but that's beside the point as Hassan N'Dam faces Ryota Murata in a rematch that saw Murata dominate (he won 118-110 on my card) and knock N'Dam down in their first fight, yet lose a stunning split decision. This decision was arguably the worst of the year in boxing and was so bad that the WBA apologized for the judging with the order for an immediate rematch. Power hitting WBC flyweight champ Daigo Higa (TRS #3) defends on the undercard (No U.S television, I think) against Tomas Masson. The undefeated Higa has stopped all thirteen of his opponents and will be making his first title defense. 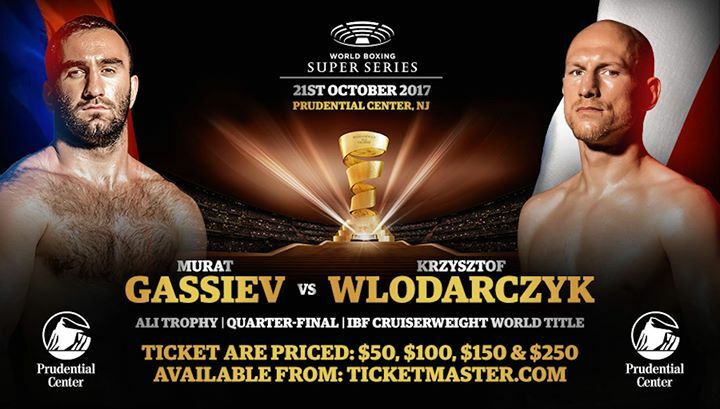 Murat Gassiev vs Krzysztof Wlodarczyk. The PPM is back after another off week. I need to get it together!! The first two college games are Thursday and Friday games so the results will be known. Another inbox cleaning and we'll start with this tremendous article from Scientific American on the 40th anniversary of the Voyager project. 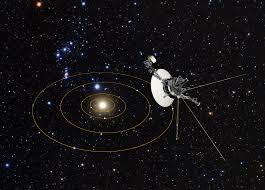 The recent film "The Farthest" from PBS on Voyager was so good and I plan on a future post just discussing the film. One of the "Moon Trees" were recently destroyed in Florida by Hurricane Irma. One of the experiments on Apollo 14 was taking several different tree seeds into space and then planting them upon return to see if the trip affected the seeds ability to germinate. Unfortunately, the seed packs burst when going through decontamination and were mixed together. No one knew if they would be able to germinate at all, but after they did, many places around the country were given one of the trees including the White House. Irma's roll through Florida took out the NASA visitor's center tree (a Sycamore). No word on if a replacement could be developed from another tree via a cutting as of now. More Irma destruction as the New York Times writes of many of the nests of Sea Turtles being devastated by Irma. This is quite a shot as Sea Turtles take 25 to 30 years to get to the reproductive age, so that takes a lot of surviving to get to that point. The Guardian writes of the catch of a translucent lobster in Maine. A translucent lobster is clear, although in this case, the lobster organs cannot be seen, so it's more of an off-white. The Maine Coast Fisherman's Association believes that the lobster is considered "leucistic", which means it has lost some of its pigment, but not all of it. I first heard this term when I had reptiles, so it wasn't unfamiliar to me, but I was surprised to hear it used with a lobster! I've been a fan of Tervis Tumblers for quite a few years now. I have almost all of the teams that I root for and you read about here (Don't have a Xavier yet) and I love the product. There are Tervis stores around the country (although none that I've ever seen) and now Tervis starting to give each store a machine that people can make their own Tervis as written in the Tampa Bay Business Journal. The "Fun Fuser" only takes a few seconds to take the inside cup and weld to the outside cup, but buyers can design their own wrap or logo for inside the cup to personalize it. Cleaning out the inbox from the sports world this time and we have plenty to offer. Starting with a suspected arson in Detroit where the famous Kronk Gym burned down. 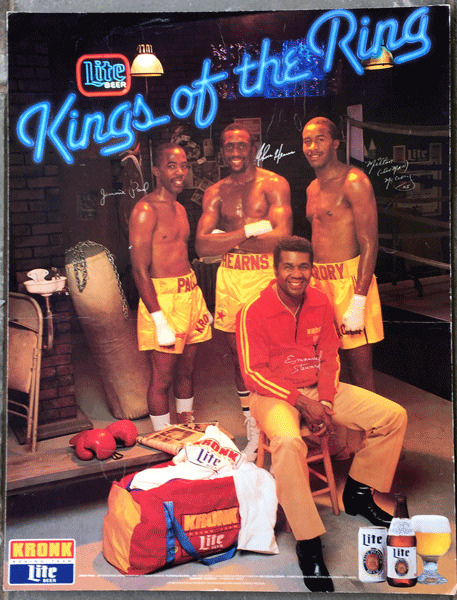 Home of the Kronk Boxing team which was so dominant in the 80's and 90's, the original building which was built in the 1920's was where numerous world champions were developed by trainer Emanuel Steward, including the three in the poster to the left in Thomas Hearns, Milton McCrory and Jimmy Paul. John Lepak writes a tremendous article on UCN about Kronk, the building, the fighters and what it was like to train there. It is one of my favorite articles that I have read this year-Great work by Lepak. The San Antonio Current writes an oral history of the USFL's San Antonio Gunslingers. Battlin' Bob listed this Deadspin article on Facebook of the story of pro wrestler Nobuhiko Takada and his attempts at real fighting in MMA. Takada was a wrestler that wasn't talented at either shoot wrestling or martial arts or anything in between, but he managed to fool people into thinking he was the toughest man in the world (If you lived in Japan maybe). That lasted until the first time he faced any competition and was easy pickings for Rickson Gracie, who was regarded as the best of the famous Gracie family of fighters. Eric Williams writes for ESPN about the "Los Angeles" Chargers needing to catch up to the Rams in the battle for Los Angeles and believes changing full time to the much-loved powder blue uniforms would be a great idea. Doug Lesmerises of the Cleveland Plain Dealer wrote a very thought-provoking article today that used the premise of the "next front office" will succeed because of the actions and deeds of the current Sashi Brown regime and that Brown and his front office will not get the credit for it. It is well written and as I said will make you think and though I disagree with much of his opinions, it is still worth the read. However, I disagreed so much with so many of these opinions that I decided to comment here. I'm not going to quote each statement as I've linked above and will be paraphrasing a Lesmerises statement and adding why I occasionally agree and more often disagree. The first is that should Sashi Brown and company's "Grand Brief Experiment" ends and "it shouldn't, oh it shouldn't" the foundation is built. Other than the best player in the draft being taken in Myles Garrett, I don't see a lot of players that I would consider "foundation players". I see a few that could be above average players (trading for Jamie Collins), but other than Garrett and perhaps Emanuel Ogbah (who I think could flourish opposite Garrett, but not as the main pass rusher) David Njoku, I don't see a lot of foundation players that have been acquired by the current regime. If anything, the lack of foundation players among all of these picks is the biggest indictment that I just don't trust this bunch to deal with the 2 first rounders and 3 second rounders next year. Credit them with accumulating these picks, but let's also keep in mind the talent that they passed to have that capital. Let's look at the talent that Lesmerises claims that is wonderful that has been brought in and I will quote from the article for this purpose.
" 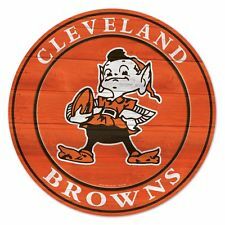 (Emmanuel)Ogbah, Carl Nassib, Shon Coleman, Joe Schobert, Derrick Kindred, Seth DeValve, Garrett, Peppers, Njoku, Kizer, Larry Ogunjobi and Caleb Brantley are out there playing from their first two drafts." I like Ogbah, Carl Nassib had a great start in 2016 but has done little since, Shon Coleman starts mainly because they have no one better and struggles weekly. Joe Schobert has played fairly well this season, but linebackers like him aren't difficult to find. Derrick Kindred is a similar case in being an average starter on a bad team. Seth DeValve has potential as a pass-catching tight end, Myles Garrett is going to be a franchise-level pass rusher, Jabrill Peppers may not be used to his strengths currently, but I wasn't a fan, to begin with, and has been a disappointment to date, David Njoku is a player that I really like and I do give this group credit for moving up to get him, Kizer is a talented project that is being pushed way before his time, Larry Ogunjobi has shown some strong flashes of potential, but is backing up Trevon Coley (credit for finding him as a free agent) and Caleb Brantley hasn't played a lot as of now. My point is these aren't foundation guys and most are in baseball parlance "Replacement Level Players", which means most could be replaced by average players and not miss a beat. When Lesmerises reaches the wide receivers, he is fair in looking at Corey Coleman's issues in staying healthy, the massive disappointment in Kenny Britt and blames "us" for being disappointed in failed middle round wideouts like Ricardo Louis (a four-tool WR missing the fifth tool-catching the football), Rashard Higgins (who I still think can help, but as a 3rd or 4th guy, not as a starter) and released players like Jordan Payton with the line of middle round picks aren't sure things. They aren't- but it's a matter of judgment to have that group of receivers and add just a Kenny Britt and wonder why things haven't gotten better. Lesmerises then says they haven't solved QB, but give them one more chance and "you can't really think they will trade down again to avoid picking a QB". Maybe not avoiding altogether, but the best one available? Sure I can and here's how- if someone- anyone in their bunch thinks Josh Rosen is equal to Sam Darnold or Josh Allen is equal to either, Can these guys not talk themselves out of taking the best player? Not take an A player when they could get picks and a B+? I'm not convinced these guys would be able to do that. Lesmerises next offers some featured players that the Browns could take in the draft and maybe they would, but I wouldn't trust them to do so and compares this rebuild to the one Sam Hinkle did with the 76ers in scrapping everything and going with a plan. My issue with the Hinkle comparison is that no matter what you think of Hinkle and his plan, the Sixers drafted reasonably well, the Browns haven't drafted remotely as well in their sport and Hinkle knew talent,- I'm not convinced this bunch really does. The finishing paragraph mentions that the fans may not be strong enough to finish the plan, but the rewards will be reaped anyway-even if the architects aren't around to see it. My problem isn't the blueprints, it's the guys buying the materials and the best blueprint can turn into a lousy building with the wrong materials. Back tonight with the Devils hosting the Tampa Bay Lightning. Cleaning out the inbox-All Baseball Version! I have several baseball notes, so I decided to do an all baseball version. It isn't often that I fill up the box with so much on one topic, but it works this time. 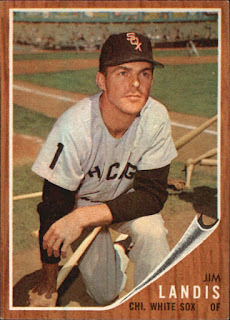 Sorry to hear of the passing of well-traveled outfielder Jim Landis at the age of 83. Landis won five Gold Gloves patrolling centerfield for the White Sox and was considered the best fielding outfielder of his day. Landis had his career year with the bat for the White Sox in 1961 with career highs in all three major categories at .283/22/85. The SABR biography of Landis can be found here. Two articles from Bruce Markusen's Card Corner with the topics both being outfielders from my youth in long time favorite Al Oliver and Bobby Tolan. I remember Bobby Tolan more as an ace pinch hitter more than a star, but he was on the verge of becoming a headline player with excellent 1969 and 1970 seasons with the Reds. I knew Tolan (article here) had missed the entire 1971 season with a torn Achilles tendon, but what I didn't know was how it happened. Back in the days where players weren't making a ton of money, in the off-season, players used to make money, free meals etc when it was offered, there were a lot more use of promoting themselves and their teams as well and one manner of doing so that doesn't happen anymore is barnstorming winter basketball teams. Usually, a few players get together (with a couple of ringers, if not enough players are on the team) travel around and play a game against some locals, sign some autographs and pick up a few bucks. The problem with this is when you take in the chance of injury and the Reds banned the winter basketball team from playing even though manager Sparky Anderson gave permission. And of course, that meant something had to happen and it was Tolan's Achilles that went. Tolan would return with a strong 1972, but that was the last above average season for Tolan's career before leaving Cincinnati. I thought I might have a chance of meeting Tolan when his son Robbie played for the Suns in late 2007, but he didn't return for 2008 due to injury and then a tragic shooting incident in Dec.2008. Almost ten years to the day, the second Forgotten Superstar in the series was long time TRS favorite Al Oliver. Markusen writes of the career of the almost Hall of Famer and what Oliver is doing today. I found one interesting note that Texas had a trade set for Oliver to go to the Yankees for Oscar Gamble, Bob Watson and Mike Morgan that was scuttled when Gamble used his no-trade clause to block the trade. SABR's Baseball Card Blog writes about card #28 in the 1959 Fleer Ted Williams set and the "Williams Shift". The shift was created to deal with Williams and was the forerunner of the shifts (far too overdone for my tastes) in today's game. I used to have a few cards in that set and despite considering myself a Williams fan, it's never been a set that I found all that visually appealing. It's becoming more and more of a trend in minor league baseball for major league teams to buy minor league teams in order to ensure that their teams cannot be moved out of a particular league or keep them in a geographical footprint that is desirable. Three teams changed hands of late as the Milwaukee Brewers are the new owners of the Carolina League's (High A) Carolina Mudcats, the New York Mets bought the International League (AAA) Syracuse Chiefs and the Texas Rangers purchased the South Atlantic League's (Low A) Hickory Crawdads. The Brewers and Rangers were buying teams in towns that their farm clubs were already playing in, but the Mets bought Syracuse, despite the Mets having one year to go on their contract with Las Vegas so the Mets will own a team for one year that the Washington Nationals will provide the players for-unless the two teams can come to an agreement to switch now, which I am sure the Mets would jump at, but I doubt that Washington would be thrilled to do. Looking at the final score in the Cleveland Browns loss to the Houston Texans, the Browns defeat looks like just another one of many. 33-17 doesn't appear to be that awful as the Browns have been beaten worse by lesser teams than the Texans. That would be wrong, as it took a pick-six by Jason McCourty and late garbage time score on a Kevin Hogan to Seth DeValve to salvage any type of decency in the deficit. Considering the circumstances involved, fans of the team may look back at this as being the day that some or even all of the Sashi Brown, Hue Jackson, Paul DePodesta new wave thinking group were overcome by a wave of their own making. More about this below, but for next week the now 0-6 Browns go back home against Jimmy Haslam's "real" favorite team- the Tennessee Titans. 1) I'll start with this- I was as down yesterday as I've ever been with football. It wasn't that I was tired after work or my fantasy team sinking to all-time lows or even a Browns loss. It was just depressing to think that this team is ruining pro football for me. I pay for Sunday Ticket to watch the Browns, which makes me either a sucker or an idiot, but I digress, and I usually pick a 4;00 late game to watch. Usually, this is some combination of the Rams, Chargers or Raiders because I like watching the games that few are watching, but not on this day. I turned the channel and didn't look back. I watched John Oliver on HBO (HBO is free here for a while), then I watched some CNN, my buddy Mike Oravec called as we talked baseball cards as I put cards away and watched some YouTube videos as some guy went looking for old coins with a metal detector in a creek somewhere. I had a GOOD time with the lovely Cherie, not a sickening one. Could this be the beginning of the end with sports? I doubt it, I love the analysis too much, but on this day- Cherie and Posey (Rachel was mostly upstairs) took a bad sports day off my mind and it was occupying enough to ride the wave to bed. 2) The Kevin Hogan experiment should be over after a one touchdown, three-interception performance that inept didn't define enough. Hogan overthrew receivers and looked downright Seneca Wallaceesque as he hummed numerous (at least four, maybe more) footballs deep into the heart of the sideline. I like Hogan, but he was overmatched on this day with this bunch. 3) That's not to place ALL of this on Hogan. He was sacked four times and harassed all day. The supposed line that was going to be one of the best in the game hasn't been anywhere near that. Now, I'm not going to lay that at the feet of the talent evaluators. Kevin Zeigler and J.T. Tretter were wanted by all teams and both have disappointed, especially Tretter up the middle. 4) On to the opposing quarterback as DeShaun Watson did whatever he wanted other than the interception by Jason McCourty. Watson showed just what the Browns were missing when they traded down with the Texans and allowed them to take Watson. Full disclosure- I was not in favor of taking DeShaun Watson with the first pick in the draft, but I would have been more than fine with the Browns taking him at 12 and not trading down. Watson's been great so far, but I'm willing to say that with the receivers in Cleveland, Watson would not be looking nearly as good. 5) Oh, those Browns receivers. Kasen Williams led the team with four catches for a whopping 41 yards and no one else seemed to be open very often. Playmakers? This just doesn't have them other than maybe Duke Johnson, who would be a situational running back on another team. 6) Speaking of the Duke, Johnson carried five times for forty yards and caught three passes for less than one yard. If Johnson is the only playmaker on this team- eight touches simply are not enough for the Browns to be competitive. 7) Cleveland does look like they have such a playmaker on defense in top overall pick Myles Garrett. Garrett had one sack of DeShaun Watson and his hit on Watson was the cause of the interception that Watson threw to Jason McCourty. 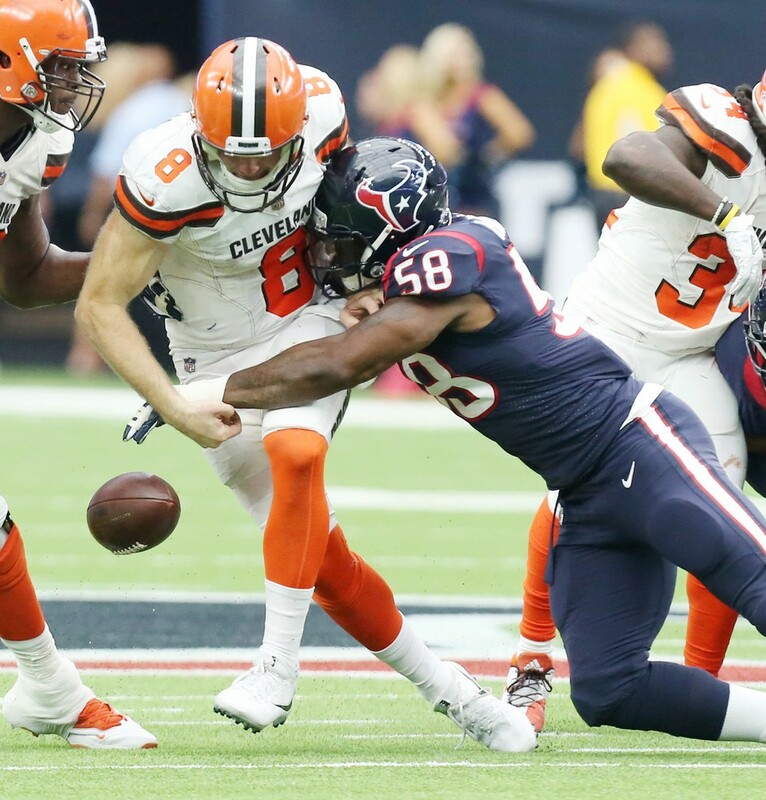 Garrett's three sacks in parts of just two games currently leads the Browns in sacks. 8) Myles Garrett is a quarterback attacking nightmare and along with the aging, Joe Thomas are the two elite talents on this team that can play on any team. Garrett also is the only player that the Sashi bunch stayed in place to select. Funny how that works out, isn't it? 9) And it's time for our weekly Jabrill Peppers bad angle and pursuit for a touchdown as Peppers missed his responsibility and was left in the dust by Will Fuller for a Texans score. Six games is a small size on a player good or bad but off that sample- I was right on Peppers. 10) Kevin Hogan played badly, but Hue Jackson's lack of adjusting his offensive play calls to take the best advantage of Hogan's skills had its share of blame too. I know Jackson loves those downfield throws, but that offense does not allow this offensive group to play to their strengths- isn't that part of coaching?? 11) Finally, rumors are flying that the Browns are looking into someone to run personnel either with the current group or instead of. All in favor- say aye AYE!!!!! Five title fights and an important minor title topped off the weekend in boxing and the gamut was covered from all ends with an explosive knockout, a knockout from a body blow, an exciting fight with give and take, a bloodbath, a squash match, and a predictable snoozer. The star of the night was a fighter that I've often criticized in WBC champ Jermell Charlo (TRS #2), who destroyed Erickson Lubin (TRS #5) with one right hand in the first round. 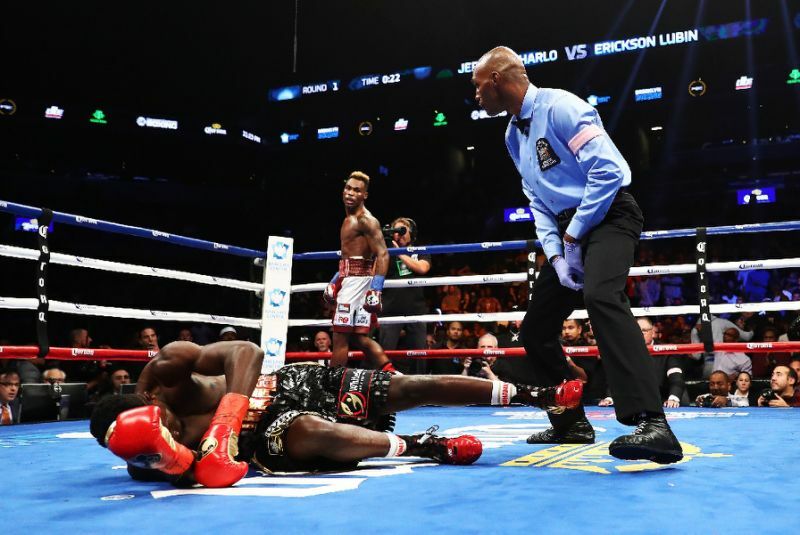 Time will tell whether Lubin was overhyped or not, but regardless of that future evaluation- Jermell Charlo took on a top contender in what was thought to be a pick'em fight (I picked Lubin to win) and blew through him in one round. Full credit to Charlo and I'm looking forward to seeing him progress against better competition (and Lubin was a step up from his past opponents). I may not care for his (and his brother's ) post-fight behavior (I've never seen guys so angry after fights they have just won), but you cannot deny results and both Charlo's are learning how to make more fun to watch fights after some early career snoozers. Charlo was calling out IBF champ Jarrett Hurd (TRS #4) for a unification fight after his knockout and Hurd retained his title in the Showtime opener in a good fight against former champion Austin Trout. Trout built an early lead on the cards, but Hurd was the harder puncher and wobbled Trout in the middle rounds. Trout battled back and cut Hurd in the seventh, but Hurd had pulled even on my card after the eighth and seemed to have Trout finished with an almost shut right eye in a tenth round that ended with Trout out of his feet. The Trout corner showed concern for their fighter by ending the fight thereafter by not allowing Trout out of his corner for the eleventh round. I had Hurd ahead 96-94 after ten rounds and it looked to me like Hurd would have likely stopped Trout in the eleventh. 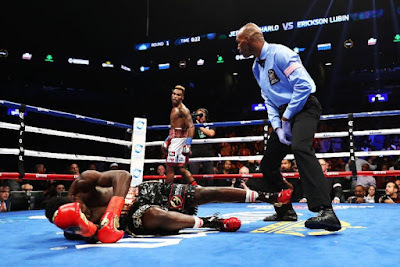 The fight was terrific and Hurd becomes the first fighter to stop Trout something that three top fighters that defeated Trout could not do (Canelo Alvarez, Erislandy Lara, and Jermall Charlo) and Trout is a bigger name than anyone on either Charlo's record. Charlo vs Hurd would be a very strong fight and should happen next, if not for the PBC's normal inclination (more later on this) to put together one of those "wonderful" prep fight cards (usually squash matches, again more later) so we will see when and if this will happen. In the main event that saw the crowd leaving the arena like water swirling around a drain, WBA champ Erislandy Lara (TRS #1) win every round over former Olympian Terrell Gausha in a fight that was the typical boring, yet dominant win for the Cuban. Lara did drop Gausha in the fourth but was more interested in flexing for the crowd than finishing Gausha, so the rest of the fight continued on its general dull path. Lara said after the fight that he was willing to fight Charlo, but there is plenty of doubt to me that fight will ever take place as the two train together in Houston, share the same trainer in Ronnie Shields and have shown little inclination to fight each other in the past. And then, we move to just what you would expect from PBC with a national television audience on Fox available was wasted when instead of putting Leo Santa Cruz and Abner Mares against each other with possible decent audiences to view, their answer was to put together a waste of time of tremendous proportions. 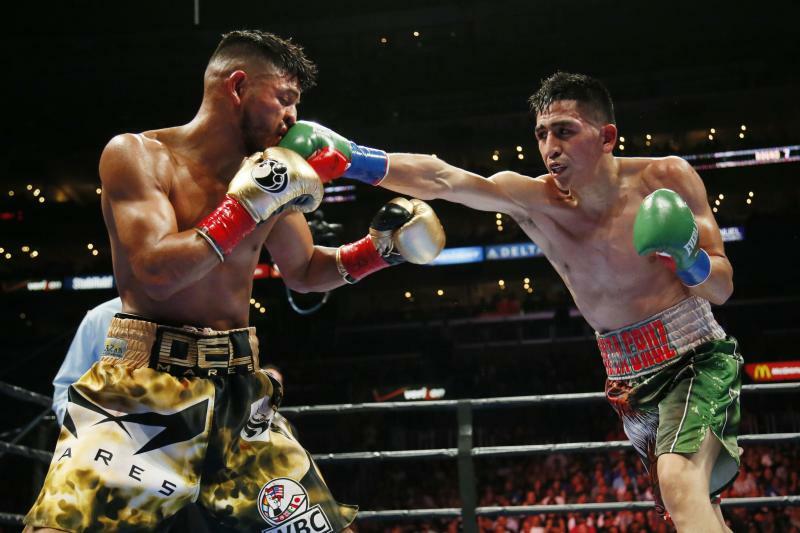 Leo Santa Cruz (TRS #1) defended his WBA featherweight title with a seven round stoppage over overmatched Chris Avalos in a squash match that should define main event squash matches. Santa Cruz won every round and generally swatted the tough Avalos around the ring as a cat would bat an almost dead mouse around a floor. This bout proved nothing other than perhaps chip a little rust off Santa Cruz and other than that minor note was a waste of time. 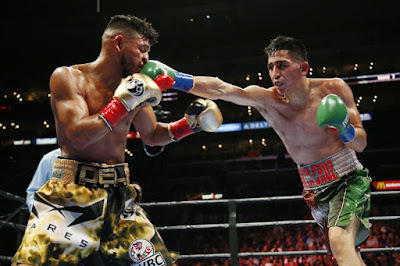 Abner Mares (TRS #5), who should have been fighting Santa Cruz, wasted his time against another durable but outgunned opponent in Andres Gutierrez with a unanimous technical decision after ten rounds when the fight was stopped after Gutierrez couldn't continue with a bad cut from a headbutt. I had Mares ahead 99-91 and was never seriously threatened in yet another fight that was unneeded for any reason other than to knock the rust off Mares-rust that wouldn't be there, to begin with, if PBC was more active for their fighters. In the World Boxing Super Series in the Super Middleweight bracket, George Groves (TRS #4) stopped Jamie Cox in the fourth round to retain his WBA title with a vicious body shot in London. Groves, who was seeded first in the tournament, received a better than expected fight from Cox, who came forward and threw plenty of punches before the sudden ending. The victory for Groves moved him to the semi-finals against fellow Briton Chris Eubank Jr in what will be a huge fight in Great Britain. I like Groves and I've never been completely sold on Eubank, but something tells me that Groves might be made for Chris Eubank.. In the boxing challenge, I earned nine points to Ramon Malpica's seven to boost my lead to 146-133. I earned two points to Ramon's one for the Leo Santa Cruz win and two to his one for George Groves victory as well. We both earned two points for the victories by Mares and Lara. We both added one point for the win by Jarrett Hurd and neither scored in the Charlo-Rubin fight as we both selected Lubin to win. Eight touchdowns in eight possessions will usually put opponents away and the Ohio State Buckeyes ripped the husk right off Nebraska in Lincoln 56-14. J.T.Barrett passed for five touchdowns and ran for two more to go with 320 yards passing. J.K.Dobbins ran for 106 yards and a score, while the receiving leader was K.J. Hill who caught seven passes with two going for scores. Ohio State improves to 6-1 on the season and 4-0 inside the Big 10. 1) No doubt about it, the Buckeye offense was rolling with 633 yards of total offense and crushed the Huskers. However, before we get too excited, let's remember that the Buckeyes haven't put up these types of numbers against anything resembling a good foe. 2) J.T. Barrett continued his posting tremendous numbers against weak teams, but I do think that Barrett has turned a corner. Kevin Wilson has become more comfortable with what Barrett can do and the offense seems to be a little more tailored to his strengths. 3) Penn State will have to deal with this year what the Buckeyes did last year before their game. Before the PSU game last year, Ohio State had to play at Wisconsin before traveling to PSU where the waiting Nittany Lions were coming off a bye. This year it's Penn State with a tough game (although at home) against Michigan with the Buckeyes getting a week off before the game. 4) Parris Campbell was wiped out of the game early on a hard hit by a Cornhusker and was replaced by K.J. Hill, who grabbed two touchdown passes in reserve. No word on Campbell's status for Penn State. 6) The win was the Buckeyes 500th win in the Big 10 conference, they hit the mark on the same day that Michigan did, but Ohio State did it in six fewer seasons, having joined the league after Michigan. 7) The biggest concern was the Buckeyes secondary as they allowed 349 yards passing and 200 of those went to Husker wideout JD Spielman. I still think the secondary will be tested by future opponents and even though Nebraska was in a position of having to throw every play, those stats against a bad team will make you wonder. 8) The win also moved Ohio State into a tie for third in all time wins. They moved into a tie with- Nebraska. 9) Urban Meyer kept the starters in far longer than I would have thought that he would have, but to me, it had to be either showing Penn State some things or keeping the starters sharp. 10) The rollover season is now over and Ohio State has reached the point where the rubber hits the road. Penn State, Michigan State, Iowa and Michigan all await and should the Buckeyes run the table, the likely undefeated Wisconsin will stand between Ohio State and the playoff, so the competition gets tougher and should Ohio State win against all of those, they will be a deserving entrant. A big weekend in the boxing challenge with matches on Fox, Showtime and another quarterfinal in the World Boxing Super Series. (TRS #1)defends his WBA title in a squash match vs Chris Avalos and Abner Mares (TRS #5) faces Andres Gutierrez. The WBA mandated a Santa Cruz-Mares fight in a rematch of their 2015 fight, but in typical PBC fashion instead of giving people what they want- take nine months off and give them something that they don't want. Santa Cruz against Avalos is a mismatch with Avalos losing more than he wins of late and while Mares-Gutierrez looks good on paper and Gutierrez has just one loss (a decision loss to Cristian Mijares) but to the only name fighter on his record. In other words-it's a card that never needed to happen. Undefeated junior welterweight Eddie Ramirez will open the show against former lightweight champion Antonio DeMarco in Ramirez's first real test. DeMarco holds a knockout win over Jorge Linares but has looked a bit shopworn of late. PBC has a far more interesting card on Showtime Saturday night with three of the four junior middleweight titles on the line in Brooklyn. The most anticipated of the triad has WBC champion Jermell Charlo (TRS #2) defending against highly regarded prospect Erickson Lubin (TRS #5). Both Charlo and Lubin are thought to have a lot of promise, but in this fight, both champion and challenger have faced not even good competition with this fight being the first test for both. I think this could go either way and could even end via knockout because we just don't know very much about either guy when the going gets tough. WBA champion Erislandy Lara (TRS #1) is the only solid favorite on the evening as the Cuban ex-patriot will defend against former U.S. Olympian Terrell Gausha. Lara is known for his smooth boxing ability that rarely excites against good opponents, so even in defeat, we will find out much about the undefeated Gausha, who hasn't fought anyone of note. Lara, who likes to call out big names and then shrink behind the big coat of manager Al Haymon, might have a vulnerable chin if someone can land a big shot, so Gausha does have hope. The opening bout has IBF titlist, Jarrett Hurd (TRS #4), putting his belt up vs veteran Austin Trout. Trout, who has a win over Miguel Cotto in 2012, has fought only once in the last two years in a loss to Jermall Charlo and hasn't beaten recognizable competition since the Cotto fight still might be a small favorite over Hurd, who is extremely talented, but owns just one win over a top 20 opponent (Tony Harrison, in his winning of the vacant belt). Are we noticing a trend with PBC's younger fighters? Four of them on this card (Lara and Trout are veterans in their 30's) are still looking for fights against good opposition-let alone championship level challengers. This only hurts their fighters, but that's their way of doing business. From London, we have George Groves (TRS #4) defending his WBA super middleweight title against Jamie Cox as the top seed in the World Boxing Super Series in perhaps the weakest bout in both brackets of the WBSS. Groves, who fought plenty of top opponents in his career with wins over James DeGale, Martin Murray and his title win last out vs Fedor Chudinov, is still vulnerable as he has lost his share as well with defeats against Badou Jack and two losses to Carl Froch takes on Cox, who is undefeated against unknown opponents. The winner will fight Chris Eubank Jr. coming off his impressive quarter-final KO of Avni Yildirim in the semi-finals. I lead the challenge over Ramon Malpica 137-126.. Fielding Failures plague Wahoo's in Game 4 Loss. Devils Butcher Colorado in opener 4-1.